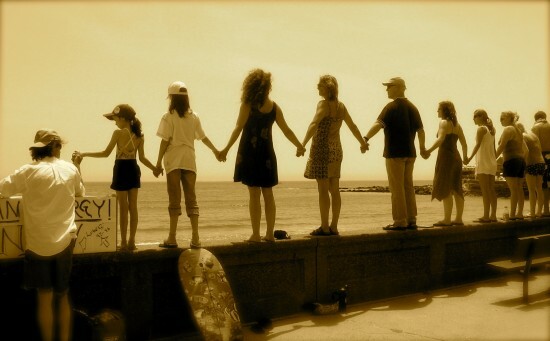 The image to the right was taken at the “hands across the sand” event in Narragansett Pier on Saturday June 26, 2010. Although attendance at the event was smaller then I anticipated, I was very happy to be there. There are 5 species of sea turtles that live in the gulf, one of which only nests there and no where else in the world. Two others are on the endangered or threatened species lists. The whales found in the area are believed to be at risk due to the way they eat. They are at risk of ingesting large amounts of oil. Concerns for the 9 species of dolphins living in the area include the risk of eating contaminated fish or starvation due to lack of fish. And, we have all seen the sad images of oil laden birds. Can you imagine being them and experiencing the hopelessness that they feel as they are held captive in a slick coat of death? It is their homes, the marshlands, barrier reefs and beaches that we see, in the media, being impacted by the spill. What we don’t see is what is happening beneath the surface of the ocean, to the coral reefs and deep sea inhabitants. Coral reefs are living organisms and they are home to many species of fish and sea animals. These reefs will be suffocated as microbes deep in the sea continue to eat the plumes of oil and deplete the oxygen needed by the coral. As the coral die off so will the beautiful spectrum of creatures dependent on it. The reverberation to the entire food chain is unthinkable but we must think about it, we must talk about it and we must take action.